OK she’s not naked anymore. I used scraps from some of my old clothes and made her some jeans and a T shirt. The pattern I used was a wardrobe pattern also from the dinky baby company sized for the 8″ dinky baby/kid. I just finished making a new doll. I used the 8″ Dinky Kid pattern from the Dinky Baby company. I still need to make clothes for her, but I’m just to tired right now. All my fabric is in a big plastic tub under other big plastic tubs. All of which are very heavy. Sooo.. her clothes are just going to have to wait until later. Felt like sewing lately. Like before it’s hand sewn, not machine. I really only like using my sewing machine for larger projects, like clothes for an adult or older child. Sometimes I’ll use it if I need to make several things and I’m in a time crunch. Other than that it’s hand sewing for me. Just something about it I find relaxing. 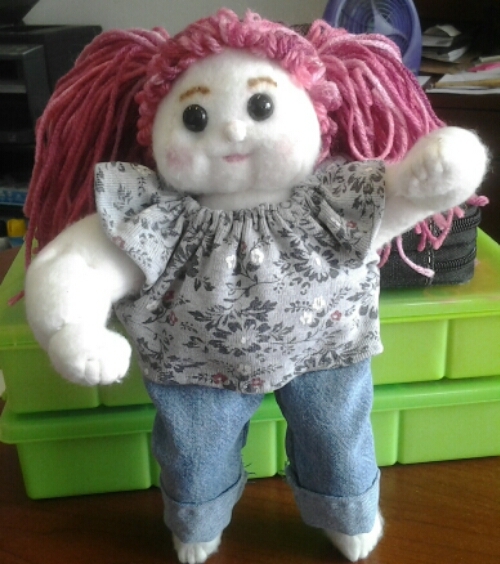 One of the things I’ve sewn is a doll dress for my 14.5″ fisher price “little mommy sweet as me” doll. The dress is from a McCall’s sewing pattern. The pattern number is (M4338) and the dress is listed as (D). The other thing I made is another “dinky dinky” from dinkybaby.com I also knitted him a little bear to hold. That was a free knitting pattern I got from here. I used sock yarn and size 2 needles to make him. I also cut the numbers in the pattern in half to get him the size I needed him to be.